You are here: Home / Images / Grenfell. Built in 1898 as the National Australasia Bank NAB.Closed and became the ambulance station in 1956. Grenfell. Built in 1898 as the National Australasia Bank NAB.Closed and became the ambulance station in 1956. Grenfell. The roaming of the local Aboriginal people became curtailed from 1833 when the first white pastoralist moved into the Grenfell district. He was John Wood squatting beyond the legal areas. It was one of Wood’s shepherds who discovered gold in 1866. He was named Cornelius O’Brien and he registered the find in Young and took out a miners lease. O’Brien went on to sell his lease in 1872 for £32,000 and his mine yielded £370,000 worth of gold over the first five years. Diggers rushed to the area in 1866, many from Lambing Flat fields (Young), when news was released and a settlement named Emu Creek sprang up overnight. On 1st January 1867 the goldfields were renamed Grenfell in honour of John Grenfell the Gold Commissioner of nearby Forbes who was killed by bushrangers in a hold up on 6th December 1866. Before then the Weddin Post Office opened at Emu Creek on 3rd December 1866 and it was changed to Grenfell PO on December 24th. The Weddin Ranges lie just to the west of Grenfell and the shire council is still the Weddin Shire. Thus the first part of Grenfell developed along the curves of Emu Creek as the fields soon had around 20,000 diggers. Buildings – hotels, dance hall and theatres, mainly canvas or wooden in the early years, crowded along the narrow George Street which was the original heart of the town. There were soon 33 licensed hotels in Grenfell. But several major fires destroyed many of the cramped buildings. Today George Street is just a narrow backstreet and the Main Street is the area of commerce, but still with a dogleg curve. The goldfield at Grenfell was a rich one but it provided its bounty for only a short time. Between 1867 and 1869 Grenfell produced over 40,000 ounces (1,100 kilograms) of gold worth over three million pounds. A few buildings of note remain in George Street despite their faded appearance and they include the Oddfellows Hall. The first one was built in 1873 and was replaced with the current building in 1888. Next to it is the old printer’s works. The Mining Record was published from 1866 (marked on the building) but became the Grenfell Record in 1875 when the new owner moved the premises to the Main Street next to the Exchange Hotel. Among the early gold miners to rush the fields was a Norwegian digger Niels Larsen. On 17th June 1867 Larsen’s wife gave birth in their tent to a baby who they named Henry changing their surname to Lawson at the same time. WE do not know but Lawson built a slab hut so Henry could have been born in that. His mother Louisa made meals and sold them to the diggers for income. Niels Lawson soon moved his family to Mudgee and that is where Henry Lawson spent most of his childhood. For some years young Henry travelled the country out west doing sheep farming work with his father which gave him later inspiration for his outback stories. In 1883 Henry Lawson went to live in Sydney with his mother. Louisa established a suffragette paper for women called Dawn. She had her own printing press and Henry Lawson’s first short stories and prose were printed by his mother. His mother, with Peter Bell, printed the radical journal called the Republican. By this time she had separated from Henry’s father. Henry accepted a newspaper job in Brisbane in 1891. His first story in the Bulletin was published in 1888. By the mid-1890s Henry had taken up drinking. Despite travel and writing and several bouts of depression he persisted with life. After his wife Bertha separated from him in 1920 he took up drinking again and attempted suicide after which he entered a deep depression and downhill slide psychologically. He died alone in 1922. Although Henry Lawson did not spent much of his life in Grenfell the site where the slab hut was built the site was recorded and dedicated in 1924 with Lawson’s wife and daughter attending the ceremony after Henry Lawson’s death. A tree was planted at the site at that time. Grenfell was early in its recognition of Lawson’s contribution to Australian literature and folklore. 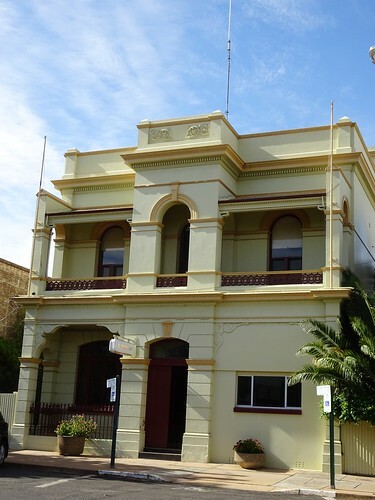 The town also established the Henry Lawson Festival, which is still held annually, in 1957 when few towns were thinking about attracting tourists to their regions or honouring their prominent citizens. The festival covers music, singing, poetry photography, writing, theatre etc. Lawson is commemorated on our ten dollar note. Although not a grand town Grenfell has charm and history. Big changes came to the town when wheat was first grown in the surrounding countryside from 1871 onwards but transport costs were a problem. A spur railway lime from Cowra reached Grenfell in 1901 and agriculture expanded. A flourmill was erected in the 1880s but when it burnt within a few years. It was replaced with the Challenge flourmill in 1901. That mill still stands although not in use. It produced flour only for our troops during the World War Two and it finally closed in the 1960s. The heritage buildings of Grenfell include the Courthouse (1879), the School of Arts (1890) and Wesleyan Church (1888) in Camp Street and the Anglican Church (1877) and Presbyterian Church (1870) in Middle Street etc.